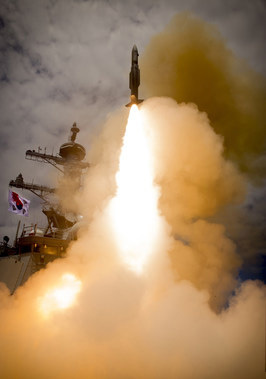 ROKN fired two Block IIIA missiles in an initial exercise to test the missiles' advanced semi-active radar seeker technology. During a second exercise, the navy destroyed three aerial threats using the Block IIIB variant. The SM-2 missile gives navies the capability to defend against anti-ship missiles and aircraft out to 90 nautical miles. "These successful flight tests add to SM-2's impressive legacy of more than 2,700 successful firings," said Mitch Stevison, Raytheon Air and Missile Defense Systems vice president. "As we begin to produce a new generation of SM-2s, the missile will be in the inventories of navies worldwide for decades to come." Raytheon restarted the SM-2 missile line in 2017 to meet global demands from international customers, which include eight international countries. New deliveries are scheduled to begin in 2020 and will include more than 280 SM-2 Block IIIA and IIIB missiles.